Press pie pasty into the bottom of a 9-inch pie plate. Bake pie crust in preheated oven for 5 minutes, use a fork to poke holes into the crust, and continue cooking until lightly browned, about 5 minutes more. 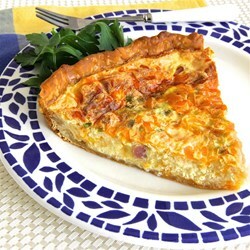 Mix 1/2 cup Cheddar cheese, Swiss cheese, and 1 tablespoon flour in a bowl; spread over the warm pie crust. Stir ham and honey mustard together in a bowl to coat the ham completely; spoon over the cheese mixture. Mix half-and-half, eggs, green onions, 1 tablespoon flour, and salt together in bowl. Pour mixture carefully over the ham layer; top with remaining Cheddar cheese.